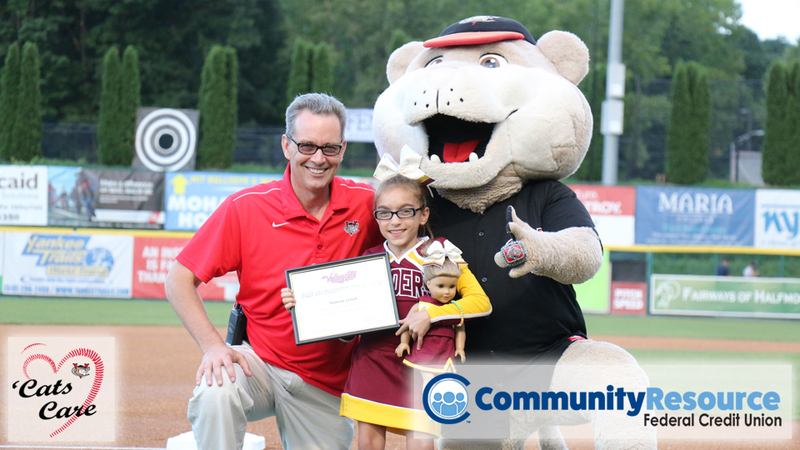 The Tri-City ValleyCats and Community Resource Federal Credit Union have partnered to recognize individuals from all walks of life who have gone above and beyond in their communities. Our Community Heroes Starting 9 will be honored on the field prior to the ValleyCats game on July 19, and will be treated to a luxury suite and complimentary food and drink courtesy of Community Resource Federal Credit Union! The following are our 2018 Community Heroes, as nominated on by the Capital Region community! While on patrol, Trooper Dutcher was the first emergency responder on the scene of a structure fire in Rotterdam, and began to assist with evacuating residents from the three-story building. He entered the smoke filled house and dragged the third floor tenant out of the home, saving his life. For his heroic efforts, the New York State Police awarded Trooper Dutcher with a Superintendent's Commendation Award. Janine is the President and Co-Founder of Nick's Fight to be Healed, an organization created to help pediatric cancer patients and their families during a very difficult time in their lives. Janine lost her son Nick to Leukemia in 2008, and founded this organization in 2009 with her husband Lucas. Janine puts in countless hours to raise money, and since 2010 the foundation has raised $825,000! Janine is also a writer who authored "What Makes Them Amazing: Inspiring Stories of Young Adults Fighting Cancer." Luke is a young student who has overcome cancer, and now gives back to others facing similar situations. This year alone, he has collected more than 62-thousand letters in which Macy's has donated $2 each to the Make-A-Wish Foundation. Luke is a Hoosick Falls hero, who has an incredible desire to help others get their wish. After Luke received his wish trip, it did not end there. Luke continues to keep on giving, and is an inspiration to many. Kirsten plays a vital role in the planning of annual events such as A Wishful Evening Gala, helping outside groups with their fundraisers to benefit Make-A-Wish, and working to develop and implement an Annual Fund plan that invites donors to support Make-A-Wish throughout the year. Kirsten lives in Albany with her husband Solon, and dog Oscar. She enjoys hiking, yoga, reading, running, and spending time with those she loves. John "Jack" Brennan has been a firefighter for 44+ years, and currently serves as Chairman of the Board of Fire Commissioners. Jerome "Jerry" Smith was recently honored for 50 years of service, and has served as both Fire Lieutenant and Fire Captain. Jack and Jerry's commitment to serving the residents of Bethlehem by protecting lives and property, is exemplary. Combined, Jack and Jerry have responded to more than 2,400 emergency incidents and have logged more than 6,900 hours between responding to calls, participating in training, along with other official duties. Richard has spent his life serving our country both locally and abroad, having earned over 28 awards including a Purple Heart. Richard served in Vietnam, and had many other assignments during his service. He was wounded while evacuating other injured soldiers, and has received countless medals and commendations. Richard was also employed by the NYS Police from 1970-2006 as a Trooper, K-9 bomb dog handler, scuba diver, and more. Richard continues to serve today, as an investigator with the Warren County Sheriff's office. Claire has been involved with Westland Hills for over 40 years, volunteering her time to manage the concession stand. She has no children in the league, but does it for the good of those who come to the park to play ball. She has also spent over 20 years volunteering at the American Legion, Joseph E. Zaloga Post 1520, serving veterans in multiple roles such as overseeing the monthly newsletter, assisting with BINGO, chairing the Auxiliary's Family & Youth Committee, and more! Steve is an athlete and volunteer extraordinaire for STRIDE, and has found his niche as a leader of the STRIDE sled hockey team! As a disabled veteran, Steve is a shining example of how a positive attitude will take you anywhere you want to go in life. His leadership skills have driven him to be the primary fundraiser for the Capital District Sled Warriors. Steve gives back to STRIDE by volunteering at events and assisting in camp counseling for kids. President/Founder/Trainer, Operation At Ease, Inc.
Joni is the President and Founder of Operation At Ease, Inc., which is a non-profit organization that pairs shelter dogs with veterans who have PTSD, and then provides a guided training program for the dog to become the veteran's service dog. All of this is done at no cost to the veteran. Joni works tirelessly to match dogs with veterans who encounter accessibility issues, and puts her heart and soul into Operation At Ease 24/7. She is truly a community hero who is helping veterans, saving dogs, and changing lives.